Back in iOS 6 Apple added the ability to remotely inspect pages in mobile Safari and UIWebViews. While I'm very grateful for that capability, the fact that it's buried in a submenu in Safari's “Develop” menu means that I have to navigate a maze with a mouse every time I relaunch the app. I decided to investigate adding a way of triggering the inspector via a keyboard shortcut. Unfortunately, while that worked if I opened the “Develop” menu at least once, it didn't on a cold start of Safari. I'm guessing that the contents of the menu are generated dynamically (and lazily), and thus there isn't a “mobile.html” item initially for the keyboard shortcut system to hook into. "Develop" of menu bar item "Develop" of menu bar 1 of process "Safari"
I wanted to attach a keyboard shortcut to this service when either Safari or the simulator were running, but not in other apps. I therefore then went to the “App Shortcuts” keyboard preferences pane (pictured above) and added shortcuts for that menu item in both apps (to add shortcuts for the simulator, you need to select the “Other…” option in the menu and select it from /Applications/Xcode.app/Contents/Developer/Platforms/iPhoneSimulator.platform/Developer/Applications/iPhone Simulator.app). 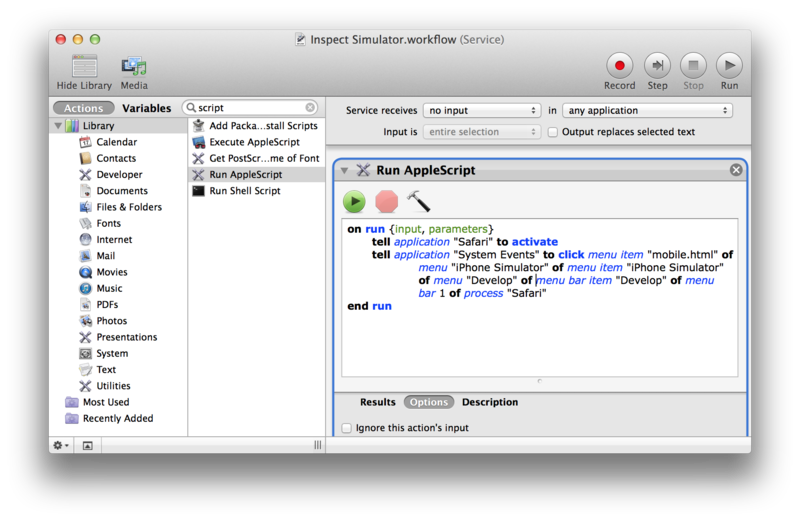 One final gotcha is that the first time the script is run in either app, you will get a “The action 'Run AppleScript' encountered an error.” dialog. Immediately behind that dialog is another, saying “'Safari.app' would like to control this computer using accessibility features.” You'll need to open the Security & Privacy preferences pane and enable Safari (and the simulator's) accessibility permissions. Not be confused with the “Execute AppleScript” action, which is a Remote Desktop one — I did that and was puzzled by the “no computers” error message for a good while. 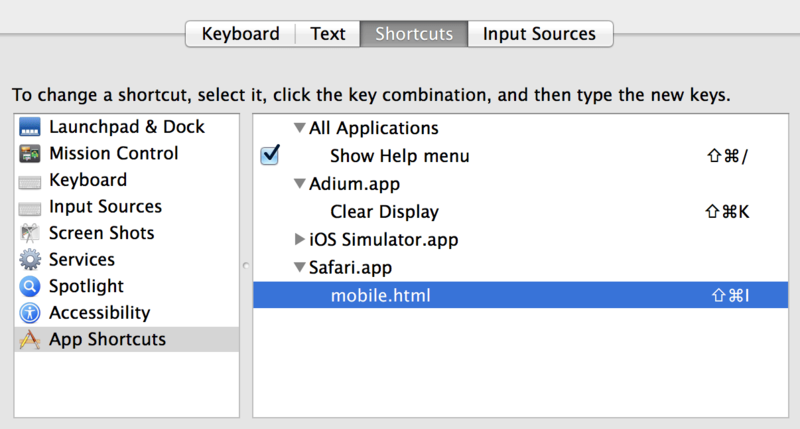 You say 'to add shortcuts for the simulator, you need to select the “Other…” option in the menu and select it from /Applications/Xcode.app/Contents/Developer/Platforms/iPhoneSimulator.platform/Developer/Applications/iPhone Simulator.app', but I don't see a way to access the Contents folder of XCode from the dialog box. Following up: I managed to achieve what I needed by selecting All Applications when I created the shortcut. @Ron: As an alternative, while the "Other..." dialog is up, you can use Shift-Command-G to navigate to a path (this works in all Open/Save dialogs). Thanks man, I have been looking for something like this for a while. We use phonegap and having to reopen the inspector like 40 times a day everytime I generate a new build is such a pain. Can't wait to test this out tonight !!! Can't say thank you enough. Setting the actual shortcut was the hardest part, because you can do it on Services menu on the Keyboard pane, but depends on the keys, it just wont work...like using hte Option. I'm not sure, but in the end, it works! Woof! Thanks for saving hours of time! !